Your cookies are disabled. You need to have cookies enabled to buy from GrabOne. We loved this deal too, but it's no longer available. Check out our other fresh deals here. Donate $5 to the Red Cross and help our Canterbury family get back on their feet. All donations collected will go straight to the Red Cross, then to the people who need it most. Kiwis from all over the country can donate to this appeal – and to get you started, GrabOne has donated the first $10,000. The team at GrabOne is deeply saddened by the recent devastating earthquake in Christchurch, and our thoughts are with everyone affected by this tragedy. 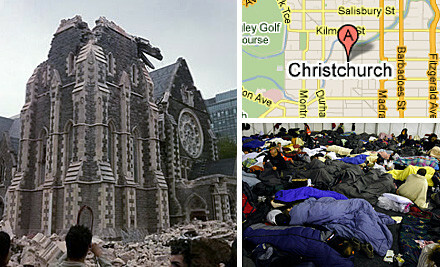 Christchurch and the surrounding areas were just getting back on their feet after last September’s big earthquake: New Zealand urgently needs to band together around our friends and family because many people will have to start from scratch - again. We’re not a big nation, so chances are we know someone who’s been affected by this latest quake. Today we’re giving you the opportunity to show Canterbury just how much you love them. Donate just $5 to the Red Cross and help the people of Canterbury who have lost homes, belongings and loved ones get back on their feet – regardless of where you are in the country. Keen to donate a little more? GrabOne and DPS have waived all credit card transaction fees so you can donate as many times as you want. If just 5,000 people from right around the country donated just $5 each, together we would raise $25,000 that will go straight to our friends and family in Christchurch. And to kick things off, GrabOne is donating the first $10,000. All proceeds will go straight to the Red Cross who will pass it onto the people of Canterbury who need it the most in the form of food, shelter, clothing and medical supplies, so spread the word via Facebook and Twitter so we can help as many Cantabrians as possible. Please note, donations can also be made directly to the Red Cross. Head to the NZ Herald for all the latest rescue and recovery developments happening in and around Christchurch. Thank you for your donation to the Red Cross. Your generosity is appreciated. Thank you for your donation to the Red Cross. Your generosity is appreciated. Must be used in one visit. A voucher is valid up to and including the expiry date stated. If you don't use your voucher before that date for whatever reason, it can still be used towards that service with that business for an additional 30 days.